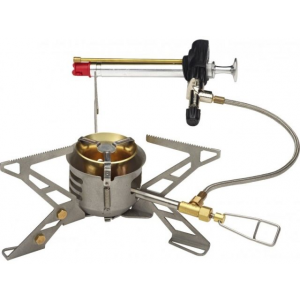 Here is a video review of the new high tech Soto Muka OD-1NP stove. Well made, novel stove, with some benefits (quiet, small, light) but for me there were some negatives too that mean I'll stick with a more traditional multi-fuel (Optimus Nova). I borrowed a demo Muka overnight to see if it was the one to replace my now broken 12-yr-old Nova. I cooked two family meals on it... risotto and porridge. Pros: Small, light as above and well made. I found the simmer control to be more than adequate, no burning (though have a good thick base Primus pot — recommended!). Nice and quiet during operation (no roar especially at lower settings). No soot, stays very clean. Cute stove. Cons: It scares me a bit! During first lighting I also ended up with fuel all over the bench, and quite a bit of it, not just a splash like I've done before when priming my Nova. I think I turned it to run before it was fully heated, and that made fuel come running out the generator thing below the burner. Luckily it didn't catch fire. The reason I turned it to run too early is that the warmup flame is quite large/yellow, probably 10-12 inches, and thinking this was wrong I tried to turn it down to the lower run settings which spills fuel. I'm sure you would get used to the controls and avoid this, and yes, it was user error, but still rather too easy to get into a dangerous situation. Also, although there is no priming so to speak, there is def a warmup phase, which results in a flame as big as I used to get during priming on my Nova. I can't see how this is better/safer for tent use. With my fuel spill I'd be wary of it. And then there's the pumping... I had a half fill bottle and it took 150 pumps, would no doubt be more like 250 when the bottle is getting empty. Packup... my Optimus pump was simple enough I always just left it in the bottle. This pump has more knobs/fittings/support at the top, such that you prob wouldn't want to leave it in the bottle, and hence exposed in your pack, which adds an extra stage to pack up, and mean more fuel around. Finally, the manual refers to needing to replace the generator unit somewhere after 20l of fuel have been used. Granted that's probably 5 years use for me, but still do I want to be looking for parts then? My Nova went 12-15 years without any servicing. Hope that helps! I'm sure it's a great stove for some people. Welcome to Trailspace, Nick. Thanks for sharing your first review with us. Great stove, complaints about pumping not warranted. "Also, the pump is threaded and removable for some reason. Im my case, I went to pick up the pump and fuel bottle by the pump handle and to my surprise and alarm it popped off leaving a pencil sized hole in the pump through which I could see inside the fuel bottle! In other scenarios this would mean fuel spilled all over my kit or even worse!!!" Elkorn in his review in September posted the above, so I immediately got out my stove to check it out. His claim is, in my opinion, preposterous. Yes, the pump handle does thread onto the pump barrel and yes, it can be unscrewed but in no way, shape, or form does it leave a "pencil sized hole" through which you could see the inside of the fuel bottle. On the other end of that barrel (the one inside the bottle) there is a brass fitting that does NOT unscrew. On the end of that brass fitting is a pin hole sized jet. When I looked through the barrel I couldn't even see light when the pump was held next to a light bulb! Obviously this leaves me concerned about the remainder of his review — particularly the part about the liquid fuel fire. I've used my stove for an entire summer season and I don't find the small amount of fumes that vent when selecting air to be onerous at all especially given the fact that you don't experience any of the smell problems associated with priming most other liquid fuel stoves. I would much rather do a little extra pumping as a tradeoff for the no priming feature and the lack of soot on my pot and the stove. 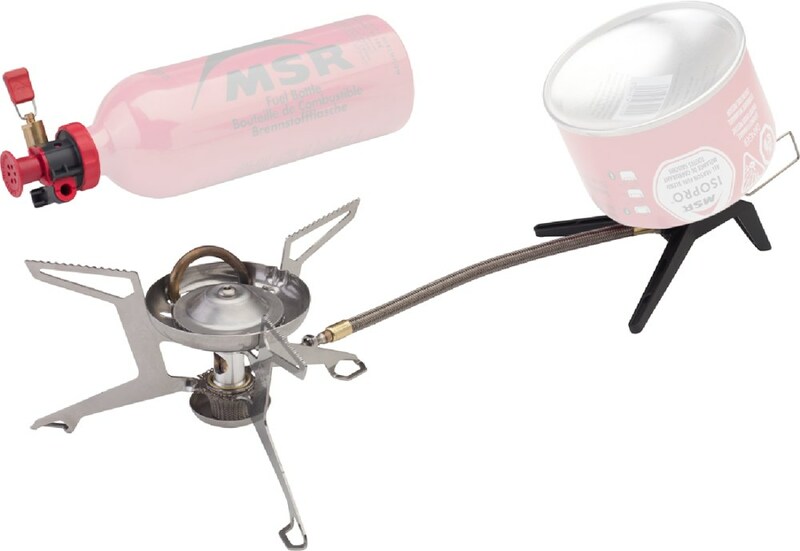 In addition to this liquid fuel stove I own an MSR Whisperlite and an MSR Dragonfly. The Muka is no more adversely effected by breezes than either of the other two stoves and is a lot less noisy. This stove has become my go-to stove when temperatures drop into the range where canister stoves become ineffective — and yes, my canister stove is also a Soto Micro Regulator and no, I don't work for Soto, I just like well engineered gear that works well. I would recommend this stove to anyone that asks about it. A royal pain to operate, have to pump it roughly 200 strokes to boil a pot of water. Leg socket became loose and unusable. Leaked fuel. Went back to using my Whisperlite. Got this because I was attracted to the no-preheat pan and no soot features. It worked pretty good at first except for the fact that it took 210 pump strokes total to boil my titanium Snow Peak pot full of water. This is a ridiculous amount of pumping. It takes about 150 strokes to get it going and then 60 more after warm up to replenish pressure after lighting. After about 15 hiking trips, the leg socket was wallowed out and was wobbly. Then it started leaking fuel out of the air intake on the burner. The last time I used it, it caught fire out of the air intake and quit working. I was so sick of pumping it what seemed like forever, I did not try to get it repaired. I went back to using my 8-year-old WhisperLite. I have never had a problem with my Whisperlite or had to do any maintenance on it. It has been on three trips to Alaska and still works like new after years of abuse. If I put my Muka with fuel bottle on the scale it is slightly heavier than the Whisperlite with fuel bottle. The Muka was a very expensive experiment for me and a total waste of money. Welcome to Trailspace, William. Thanks for sharing your Muka review. I'd love to see a review of your Whisperlite or Snow Peak pot. This is a comment about Soto the company rather than the Soto Muka (which I own). I recently had reason to contact Soto as I had unintentionally damaged their product. I began by writing them at the customer service e-mail address posted on their website. A representative wrote me back immediately and after a few details passed through e-mail I was given the name of another representative that could better service me in the area I live. That representative contacted me within 24 hours and resolved my issue. There was no run-around and from start to finish I was made to feel as if I was the most important person they had to deal with and my issue was the most important thing they had to solve. Both Soto representatives stayed in contact with me throughout the process. I was not handed off — the person helping me became a small team helping me. This company is a full cut above. They make superior products (please show me a white gas/gasoline stove that is of higher quality or stronger performance than the Muka) and stand behind them with world class customer service. Even if you are a "nobody" like me. It is light and hot and easy to use. The stove is light and small. The fuel line seems a little fragile, so I stored the stove in a rubbermaid container so it wouldn't get crunched. It lights quickly and easily, no priming. It has no real simmer. You can turn it down from full blast to lower, but rice, for example, will boil over. I used a cozy that I first used to finish rice cooking on my alcohol stove (only enough burn time to get the rice up to a boil; when the stove burned out, put the pot in the cozy for 20 minutes; perfect every time!) instead of simmering. But it boils very fast. I think I messed up and used a bottle that had had alcohol in it for gasoline; the filter that is just before the jet got clogged, and the stove stopped working after a few days of dwindling performance. That filter is small and behind a pressed-in screen. Real hard to get out without destroying it. Easier to just use clean fuel! The claims of efficiency are correct, and the stove is quite powerful. The pumping requirements are a con. All this aside, there are major safety concerns that need to be addressed! The operating procedures for this stove are similar to other liquid fuel stoves, but the priming and decompression are a bit different. One thing to note is the VERY high output, so when you are lighting the stove beware of the potential to burn your arm hair. This stove burns at two levels, high and extremely high output. I would only use for boiling water, and it does this in similar amounts of time to other stoves. With other liquid fuel stoves, one must unscrew the pump to de-compress the fuel which leaks fuel. This stove offers the "air" setting which is very handy but releases all of the air tainted with fuel and can be nauseating in small quarters. This stove is not as windproof as other stoves I have owned, the flame would flicker in breezy conditions. The Muka is similar in efficiency to other stoves, perhaps a bit less efficient. Engineering-wise, the Muka is stable and solid and packs into a small size which is quite lightweight. 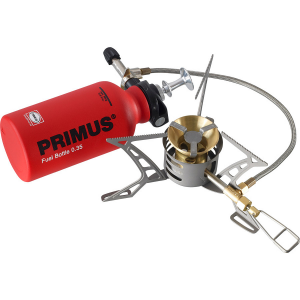 The quick-connect fuel line is brilliant and is much easier to use than other stoves. Now for the really important stuff. I was using this stove on a 3-day trip in the summer at about 7,000 ft and discovered two potential disaster scenarios! When the stove first starts up in the "start" mode it runs thin order to heat the fuel line that runs over the burner. Theoretically the flame turns blue and you switch it to "run" with no problems, which is what happened most of the time. HOWEVER, once during this trip the flame did not turn blue and when I switched to "run" the flame jumped quite high, then fuel actually began to spill out of the stove and spread onto the rock which I was cooking on! This is the only time I have ever un-intentionally started a liquid fuel fire using any stove for many years. Luckily, the emergency stop feature worked and none of us were injured. Also, the pump is threaded and removable for some reason. Im my case, I went to pick up the pump and fuel bottle by the pump handle and to my surprise and alarm it popped off leaving a pencil sized hole in the pump through which I could see inside the fuel bottle! In other scenarios this would mean fuel spilled all over my kit or even worse!!! The stove is nice, but the excessive pumping and potential for danger make it something for the pawn shop. I think this is the stove with the best quality. I think this is the stove with the best quality. 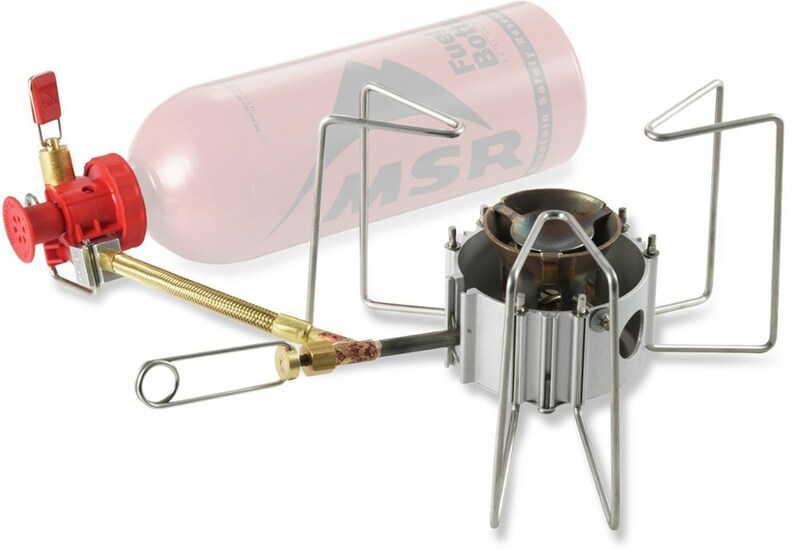 Many stoves I have tried, such as MSR, Optimus, and Coleman. This stove is able to combine the various technologies and implement them into a best stove technology. Perfect burning. Lightweight. Simple maintenance. And priced according to a stove like this. It is true, Japanese products are always superior. First time out of the box, the stove leaked fuel, unknown to me until it all caught fire. After a good clean up, set it all up again and all ok. Seems as though the first time raw fuel came through instead of the fuel/air mix, which should be to start the stove. It's an easy stove to start and runs clean, but its not possible to simmer,any attempt to operate at a low setting causes the vapouriser to drop out, and you have yellow sooty flames. I have found this problem on all stoves where the control valve is some distance from the burner jet (like this one). It will boil a litre of water in just over 3 min. This is good. The bad points, the general construction is plastic, the pump washer is also poor, and of course it needs a lot of pumping. Being Japanese I would expect better quality, especially at the price asked for this. This stove uses a generator to vaporise the fuel, assisted by an air premix,an idea taken from Coleman it seems, lets hope its reliable,only time will tell. Its a good stove works well, but all the pumping is a pain,perhaps if the pump was better designed it would be easier to pressurise. I don't think it's any better than the PRIMUS Expedition multifuel stove, much easier to use and boils quicker. Just received this stove and tried it out using an Primus EtaPower 1.2L pot (for high efficiency) and a recipe from the latest Backpacker magazine. I couldn't get the heat low enough to simmer! It was however very easy to light requiring no priming. I'll try again with a less efficient pot and see if this helps. Good stove but too much heat when not needed. Construction and fittings: Solid, very nice connection fittings, folds elegantly. Pump is solid metal parts, very sturdy design. Simple, easy to open and service. Pump is wider diameter than a Whisperlite, hence the wider mouth on the bottle (and thus, the requirement for a proprietary bottle. 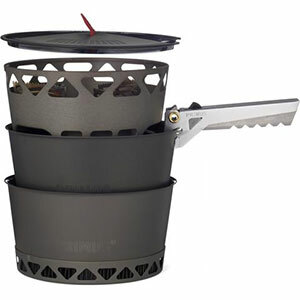 Weight: The burner weighs 5.6 ounces, and packs more compactly than a Whisperlite. The pump weighs 5.8 ounces, and is significantly longer than the Whisperlite pump; it is not going to fit into your 1 quart pot. Overall weight at 11.4 ounces is slightly lighter than the Whisperlite burner + pump. Stability: Very stable assembly. Lower pot stand height than a Whisperlite. It is also possible to run the stove with its legs folded if you want to, placing it between rocks to support a really large kettle. Start up: With bottle 3/4 full, I pump it about 125 times to get it up to pressure. Starts without priming, very little flaring of orange flame, and settles into a hot (blue) flame quickly. Once I switch from start up to run mode, I may need to pump it another 10 or 15 times. After that, I will not need to pump it again--for the rest of the meal's cooking. And I don't have to move the bottle closer or farther from the heat to keep it running well. The connecting hose is longer than a Whisperlite, because bottle heat is not necessary to maintain pump pressure. This stove keeps atomizing fuel due to the high pressure you have pumped into it, not due to the heat of the tank or burner unit. What this means is that the stove will run STEADY, at high heat or at a simmer. High heat: Output in BTU's is hotter than a Whisperlite International, boiling the same amount of water 30 to 60 seconds faster (no precise number here, I've misplaced my notes of the time trials). Noise on high is louder than a Whisperlite, but significantly quieter than a Dragonfly. It won't block conversation in the kitchen the way a Dragonfly will. Low heat: THIS STOVE WILL SIMMER! You can simmer with a Whisperlite, if you don't pump it up more than 15 strokes or so, but you have to fuss with it constantly unless the bottle is in the sweet spot of about half full. I bake bread with an Outback Oven on the trail, so simmering is a must for me. With a Whisperlite, I have to hover over the stove the whole time, tinkering with the heat control. 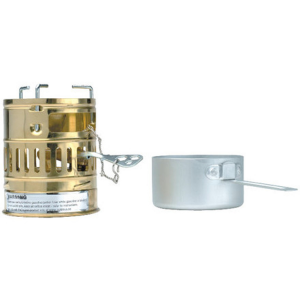 The Soto Muka stove runs STEADY, because it is running on that high pumped tank pressure. You can set it on a simmer and walk away. I tested this by running a quart of water at a low simmering boil. The stove maintained this simmer without any activity on my part for 45 minutes. I think it would have continued for significantly longer, but I had to turn it off and go to a meeting at that point. While using an Outback Oven, I found it possible to turn the Soto Muka TOO low, and have it burn STEADILY at a temperature that wasn't quite hot enough to get the job done! (This is also true of the Dragonfly.) This would be impossible with a Whisperlite. So this stove's temperature range is wide enough and steady enough to cover any camp cooking requirement. When simmering, the Soto Muka is noisier than the Whisperlite's simmer (the latter's simmer is virtually inaudible). This means that the Soto's simmer is audible enough that you can tell it is running, under the Outback Oven, without having to check it frequently. And, as I've said, it will maintain that burn rate quite steadily. Once you figure out the right power output for baking, you can set the stove up and leave it to bake the bread while you are pitching your tent or doing other camp chores. Cleanup: The stove doesn't get sooty. You don't get soot on your hands or gear. You can flush the line with air pressure from the tank when you turn it off, so you don't spill fuel from the line when you disassemble it. If you don't vent it, you can leave it sitting all night pumped up, and pressure will be there to start it again in the morning. Overall convenience: The stove starts quickly, and gets up to running heat quickly, once it is pumped up. But pumping it up 125 times or more takes some time, and some effort. I can probably get my Whisperlite up and running faster than this stove, since to simmer I only pump the Whisperlite 10 to 15 strokes. I'll use up that time I saved starting the Whisperlite later, washing the soot off my hands. Once the stove is running, life gets easier with the Soto. The control valve works very well, you can choose your rate of burn, set it, and forget it. Faster boils (if you want them), and slower, steady simmers. The Soto beats the Whisperlite hands down here. The Dragonfly can probably hold its own against the Soto in terms of steady temperature range -- but makes a lot more noise, enough noise on high that conversation is difficult. Again, the advantage is to the Soto. Fuel efficiency: I haven't quantified this yet. The BTU output of the Soto (running wide open) is quite high, and this is a way to run through fuel more quickly. With any stove, as with a car, if you take a little longer to get there, you'll get better mileage. hikin jim says he's using more fuel with this stove. What I don't know -- is he heating things more quickly with it, and burning through fuel faster for that reason? I remember a 9 day trip to the Wind River range where my buddy with the new Dragonfly went through half his fuel in the first three days. Once he realized that he didn't have to run it on high, and slowed it down, he finished out the trip with fuel to spare. 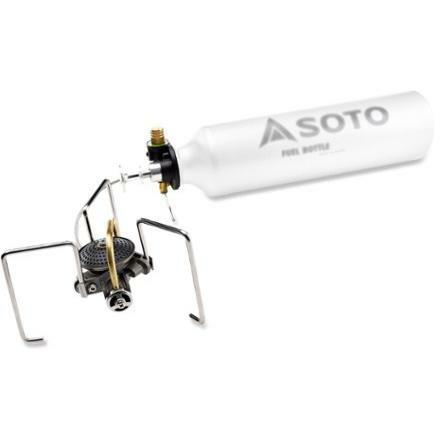 With the Soto Muka stove, you can certainly slow it down if you want to. At some point I'll do some baking comparisons of this stove and the Whisperlite, and weigh the tanks before and after, to try to quantify the fuel consumption of each. The Soto Muka is not available from the stores we monitor. It was last seen July 28, 2016	at REI.